Otherwise entitled: Black Hawk Down. We headed out early to see the sights before the heat melted us! First stop was a quick side-of-the-road pullover to see the Colossus, below. Then it was on to the famous (or rather infamous) Valley of the Kings just outside Luxor. We arrived and went through security (all Egyptian sights require tickets and have security guards and metal detectors, though it seems the rare occasion that they actually pay attention to them) and hopped the tram to the main entrance, after which we walked. 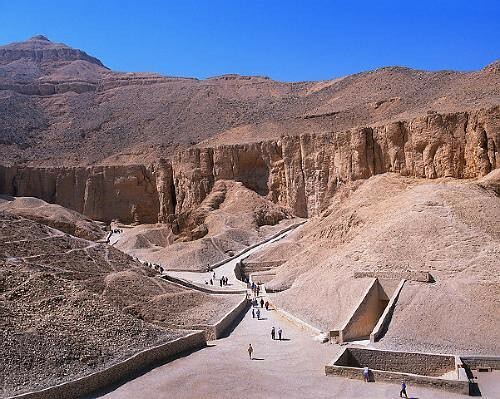 The Valley of the Kings consists of 32 tombs, along with an extra that was left unfinished. Only six of them are open to the public, and two require extra admission. The three tombs ticket is the most common, and we entered the tombs of Ramses I, Ramses II and Ramses IV, plus we paid to enter the tomb of King Tut. The worst part– no cameras allowed, even outside, so below are photos off google, interspersed with my commentary. Above, how the Valley of the Kings looks. The tombs were dug into the mountains, because they looked something like pyramids but were not as obvious and thus not looted as much in the beginning. The tomb of King Tut was so well preserved because another pharaoh actually built a tomb on top of his, so looters never looked below. Cool, huh? Above, walking down into the tomb of Ramses II. All the walls were intricately carved and many still had intact colors. So cool! Afterwords we stopped by the temple Deir el-Bahri, or the temple of Hatshepsut, most of which has just been reconstructed. And to top it all off, before our long drive to Hurghada, where we got to see the Red Sea before moving on to Dahab, we stopped at Karnac temple. And afterwords, we went for dinner and drinks to chill out after the hot, hot, hot day. PS The title of the post comes from another groupmate, Jim (yes, just like you granddad…). He was constantly buying all the little ‘trinkets’ from the ‘we no hassle you, just come here,’ ‘our stuff good rubbish’ marketmen, and we were SWARMED when we left the Valley of the Kings, to the point that someone had to go back for him… good times. Otherwise entitled: Temples… and more temples. We started out the day playing a little catch up, since our felucca hadn’t made it in to Kom Ombo the previous night as planned. Below, the temple at Kom Ombo, a “temple within a temple,” as materials from the original temple lie within the newer one (see lower picture). After that we headed to the temple at Edfu, a temple to Horus, on our way to Luxor. Later that day we arrived in Luxor, and saw the temple, the avenue of the sphinxes and the marketplace before turning in for the night (after a quick ice cream!). Sorry this entry is so brief, but for some reason when I was writing it I had a hard time remembering specifics! Next up is Valley of the Kings though! Otherwise entitled: One little, two little, three little mozzie bites. We headed out early to catch our flight to Abu Simbel, location of the famed temple of Ramses II. Egypt airport security was pretty chill– we walked through security on our way in the doors and didn’t need an ID at any point. The flight was short, and I discovered that the man whose article I had read on the flight over and who had been filming in the Egyptian museum was actually a really important Egyptologist– Dr. Zahi Dawass. Check BBC in a few months– maybe I made the cut! Abu Simbel was incredible. No other way to describe it. It’s set up where you have to walk around the back of the temple to get to the front and so all of a sudden the sculptures just appear. It’s actually two temples– one that Ramses II built to himself and one he built for his wife Nefertari. It’s a significant temple because it was built to a man, rather than to a god. 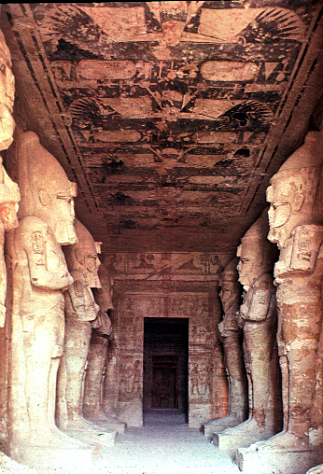 Below, the front of the temple of Ramses II. The inside of the temple was incredible as well. The colors and drawings were beautiful- I can only imagine what they must have looked like when it was first built. Photo credit goes to google– no photos allowed inside the temples. Below is the front of the temple built to honor Nefertari. After an exciting morning, we headed back to the hotel to shower before boarding our next means of transport– a felucca! A felucca is an Egyptian boat (see below). It zigzags up the Nile and is a quite peaceful way to travel (except for when it’s miserably hot or you’re being attacked by mosquitoes). We spent two nights on the felucca and an entire day, and didn’t actually end up getting much of anywhere because it was too windy! Below, a felucca, courtesy google, and our dinner spread the first night. Definitely an Egyptian experience! We learned a lot about each other and shared our customs and culture with Adel, as he did with us. While I don’t agree with many Egyptian views, particularly regarding women, it was a fascinating conversation. Otherwise entitled: It’s all relative. Then we headed to see the Aswan high dam. When the Egyptians built the dam, much land was flooded and they actually moved several ancient sights to preserve them before and after the flooding occurred. One of the sights that they moved was the ancient Philae temple, a temple to Isis that resided on an island that was flooded. On the stone you can actually see the marks from the flood. The black mark is the water line. Otherwise entitled: Ancient wonders of the world. After years of watching The Mummy obsessively, I finally made it to Egypt to learn all about the history of pharaohs firsthand. Last night when I got in (after a super sketch cab ride that resembled something out of the movie Taken— don’t worry, Mom, I’m fine) I met my roommate Kathy, who was also on the trip by herself. Score! Then in the morning I met the rest of the group (vast majority Aussies) and headed to the Egyptian museum. While it was absolutely PACKED with tourists, it was SO WORTH IT. All those amazing treasures you hear about? All there. All amazing. For an hour or so our tour guide, Adel, who we got to know quite well over the week gave us a guided tour, and then we got time on our own to explore. Kathy and I hit the mummies room first (it’s an additional fee, for the record, and costs more than the actual admission to the museum) where mummified pharaohs including Ramses II are housed. Next we headed to see the rooms dedicated to King Tutankhamun, the ever-famous boy king of Egypt. My dad and I went to the King Tut traveling exhibition several years ago in Chicago and ever since I’ve been wanting to see the actual mask and sarcophagus, the famous blue and gold. Suffice it to say, entirely cool morning. Afterwards, we headed out to see the famous pyramids at Giza, only a few minutes drive outside a (very) smoggy Cairo. Here they are, below, one of the seven wonders of the ancient world. Then I decided to… ride a camel! Adel arranged it and the twenty minutes were interesting. You feel lopsided, like you are sliding off the camel, and the ride is a bumpy one. By the end of it, Kathy and I were about to pass out (it was about 57 C– that’s in the 130s for you Americans) so we hopped on to the bus to cool off a bit and then went to climb down into the second pyramid. Crouched crawling awkward slanted steps down, awkward slanted steps up, reverse, have been inside a pyramid- check. Then we went to see the Sphinx. Otherwise entitled: Run… and you’ll STILL miss the plane. Well, ladies and gents, it’s official: travel crisis number one has occurred, and I have officially, for the first time ever, missed a plane. It’s a rather long story, but suffice it to say that I (thankfully) made it to Cairo to meet up with my tour on time. Not an experience I would care to repeat. Many thanks to my poor father who I dragged out of bed with my hapless sobbing to help me out. Otherwise entitled: City of Paradoxes. The first exciting moments of my trip were spent in Morocco. Christina and I flew into Marrakech Friday morning (after a slight delay) and were excited to realize that though the Moroccan border security had taken an entire page in our passports, it was an endorsement page– no one stamps there anyway! So all was well. We hopped in a cab and checked into our hotel, which was resort-style with several buildings, restaurants, and a huge pool. After tossing our things in the room, we decided to walk to see the Koutoubia, a tower that stands next to the mosque in the city. It was a fine walk, but ohmigod it was hot! We estimated it was somewhere in the mid to high 90s. Ick! After declining the ride, Christina and I hopped back in the cab for a trip to the tannery, while I continued translated (French is widely spoken in Morocco). The tannery (while smelly), was really cool! We got walked around the area, which is both a factory and living space, and shown the different steps in making leather. The second step involves soaking in pigeon poo for 15 days. Eww! Below, a picture of the tannery and of the shoes I purchased (the outside still sort of smells…). Sorry they are pictured sideways, but I was too lazy to fix it. After the tannery we went to a spice pharmacy, where they do everything from selling cooking spices to making herbal remedies. We got a guided (and interactive!) tour there too. Then we called it quits for the day and went to lay out by the pool. Most time I’ve spent in my swimsuit in quite a while. The next day we were off again, though at somewhat of a later start; the palaces opened later. But we ended up visiting Marjorelle Gardens first, after getting henna (see below). Then we visited two successive palaces, the Bahia Palace (the royal family still uses part of it!) and below that El Badi palace, which unfortunately is ruins. My most vivid memory of Morocco will remain this: that it is a country of paradoxes, where cars and camels ride side-by-side, and where the slums adjoin ritzy tourist resorts. Our last day (today) didn’t allow for any time to explore, and upon check out we found something strange… the time on my watch did not match the time on the clock. Turns out the time had changed and no one had told us! Thankfully we had allowed plenty of extra time to get to the airport so we were fine, but what a surprise! My recommendation for viewing Morocco would be this, based on my experience: go with a group, or with a man. As two women we were limited safety-wise. And I think it’s worthwhile to take a tour– a few days here, a few days there, across Morocco. But that’s just my opinion. Overall, an interesting country, but today it was au revoir, Maroc to return to Spain, where a week of adventures awaits.